The Book of Henry is a 2017 American drama film directed by Colin Trevorrow and written by Gregg Hurwitz. The film stars Naomi Watts, Jaeden Lieberher, Jacob Tremblay, Sarah Silverman, Lee Pace, Maddie Ziegler, and Dean Norris. The story concerns a plan hatched by a young genius, dying of cancer, to save the girl next door from abuse. The film premiered at the Los Angeles Film Festival on June 14, 2017. It was released in theaters by Focus Features on June 16, 2017, and received generally negative reviews from critics, mostly focused on the film's plot twists and tonal shifts, and Trevorrow's direction, although the cast received some praise. In a small suburban town in the Hudson Valley, 11-year-old boy genius Henry Carpenter and his younger brother Peter are being raised by their single mother Susan, a waitress who is working on writing children's picture books. Henry has used his intellect to invest successfully in the stock market, building up a very substantial nest egg for his family. Henry also protects Peter from a school bully and builds Rube Goldberg machines in their tree house. Henry and Susan are both fond of their next-door neighbor (and Henry's classmate), Christina Sickleman, who has recently become glum. Henry sees Christina being abused by her stepfather, Glenn, the local police commissioner. Henry reports the abuse to social services and the school principal, Janice Wilder, but Glenn has connections throughout the local government, and Wilder is reluctant to challenge the commissioner without "conclusive evidence". Henry is unable to get the authorities to launch a serious investigation that would protect Christina. Henry tells his mother that when someone is in trouble, those who can help must take action. He develops a detailed plan to rescue Christina that he memorializes in a notebook. After a violent seizure, Henry is taken to the hospital, where he is diagnosed with a brain tumor and undergoes surgery. Anticipating his death, he tells Peter to give Susan the notebook. Days later, Henry dies in Susan's arms in the hospital. Susan is distraught at Henry's death and has difficulty functioning, but when Peter gives her the notebook, she focuses on Henry's plan. Susan tries, but fails, to interest a nearby social services agency in opening an investigation. One night, from the window in Peter's bedroom, she sees Glenn in Christina's room and decides to carry out the plan. The notebook and an accompanying cassette tape describe Henry's step-by-step plan to kill Glenn with a sniper rifle while covering Susan's tracks so that it will be impossible to trace the murder back to her. Susan's alibi is to be provided by executing the murder while both Christina and Peter are performing at a school talent show. Susan slips away from the talent show and puts the plan into motion. As she is about to pull the trigger, however, she realizes that Henry's plan, though ingenious, is the construct of a child, and that she must act as an adult. She immediately confronts Glenn and tells him that she is going to expose him for what he has done to Christina. Glenn replies that everyone will believe him, not her, and he tells her that he is going to call his police chief to come and bring her in. At the same time, affected by Christina's dance performance at the talent show, Principal Wilder decides to follow through on the abuse accusation and contacts the authorities. Glenn returns home, calls his relative at Social Services, and learns that an investigation is being opened into his abuse of Christina. As the police arrive at his house, Glenn kills himself. Susan legally adopts Christina as her daughter. She also finishes writing one of her children's books, as Henry had urged her to do. Hurwitz wrote the first draft of the screenplay by 1998. The film was eventually optioned by Jenette Kahn, and Sidney Kimmel Entertainment joined as a producer. An executive at Kimmel Entertainment thought that Colin Trevorrow would be right to direct The Book of Henry. Trevorrow and Hurwitz found each other to be congenial, but then Trevorrow was hired to direct Jurassic World. Another director was considered. By early 2015, after Trevorrow finished Jurassic World, he returned to The Book of Henry. Kimmel Entertainment and Double Nickel Entertainment financed and co-produced the film; producers are Sidney Kimmel, Kahn and Adam Richman. Focus Features obtained worldwide distribution rights. Principal photography on the film began in September 2015 in and around New York City, and concluded in November. The music was composed by Michael Giacchino. Stevie Nicks sang a new song in the film. The Book of Henry was scheduled to be released on September 16, 2016, but Focus rescheduled the film's release to June 16, 2017, concluding that during the summer, the film release schedule would offer fewer adult-oriented films that might compete against The Book of Henry for older viewers. The film premiered at the Los Angeles Film Festival on June 14, 2017. In its opening weekend, the film grossed $1.4 million from 579 theaters (an average of $2,460 per theater), finishing 13th at the box office, and making it "by far the biggest start among the new Specialties" opening that weekend. The film was featured at the July 2017 Ischia Film Festival, where Trevorrow was honored with the Breakout Director award for the film. On Rotten Tomatoes, the film has an approval rating of 22% based on 134 reviews, with an average rating of 4.02/10. The site's critical consensus reads, "The Book of Henry deserves a few points for ambition, but its tonal juggling act – and a deeply maudlin twist – may leave viewers gaping in disbelief rather than choking back tears." On Metacritic, which assigns a normalized rating, the film has a weighted average score of 31 out of 100, based on 31 critics, indicating "generally unfavorable reviews". PostTrak reported audiences gave the film an 86% overall positive score and a 65% "definite recommend". Caroline McVitty commented in The Island Packet that the film was one "that critics hate and audiences love." Owen Gleiberman of Variety wrote: "There’s the kind of bad movie that just sits there, unfolding with grimly predictable monotony. Then there’s the kind where the badness expands and metastasizes, taking on a jaw-dropping life of its own, pushing through to ever-higher levels of garishness. The Book of Henry ... is of the latter, you’ve-got-to-see-it-to-disbelieve-it variety." The Guardian's Peter Bradshaw, in a critical review, said that, "in its pure misjudged ickiness, bad-acting ropiness, and its quirksy, smirksy passive-aggressive tweeness, this insidiously terrible film could hardly get any more skin-crawling." Writing for Vulture, Emily Yoshida opined, "It does not suffice to call The Book of Henry bad; it’s nonfunctional, so poorly conceived from the ground up as to slip out of the grasp of the usual standards one applies to narrative film. It might be admirable if it wasn’t such torture to watch." Ignatiy Vishnevetsky of The A.V. Club wrote: "Director Colin Trevorrow ... lacks any of the eccentricities that might make this quirky and contrived material work, even at face value," though he added, "its above-average performances and insistence on following through on an off-beat premise give it a hint of battiness." 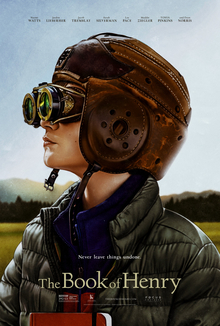 Writing for Rolling Stone, Peter Travers gave it 1.5 stars out of 4, saying: "The Book of Henry starts well, begins flirting with absurdity in the middle – and ends in crashing disaster. But the feeling persists that director Colin Treverrow believes every word in the shambles of a 20-year-old screenplay by crime novelist Gregg Hurwitz." Stephen Schaefer of the Boston Herald was one of the minority of critics who praised the film, as was Colin Covert of the Chicago Tribune, who concluded: "This is a poignant, frequently funny film that moves into unexpected dark subjects." ^ "The Book of Henry". British Board of Film Classification. Retrieved May 25, 2017. ^ de Seife, Ethan (December 30, 2015). "Jurassic World Director Colin Trevorrow Looks Ahead". Seven Days. Retrieved March 31, 2017. ^ "The Book of Henry (2017)". Box Office Mojo. Retrieved July 12, 2017. ^ Perez, Rodrigo (May 5, 2016). "Interview: Colin Trevorrow Talks The Book of Henry & Going From Blockbusters to Indie Films Again". ThePlaylist.net. Retrieved March 31, 2017. ^ Gettell, Oliver (October 5, 2015). "Colin Trevorrow introduces young Book of Henry stars on Twitter". Entertainment Weekly. Retrieved March 31, 2017. ^ a b Manskar, Noah (November 3, 2015). "Naomi Watts movie The Book of Henry films in Williston Park". The Island Now. Retrieved April 1, 2017. ^ Le, D. Dona (January 1, 2016). "Exclusive Q&A with Gregg Hurwitz '95 (Orphan X, The Book of Henry)". Harvardwood. Retrieved March 31, 2017. ^ Kit, Borys (March 30, 2015). "'Jurassic World' Director Colin Trevorrow Tackling 'Book of Henry'". The Hollywood Reporter. Retrieved April 5, 2015. ^ Sneider, Jeff (March 30, 2015). "Jurassic World's Colin Trevorrow to Direct Book of Henry for Sidney Kimmel". thewrap. Retrieved April 5, 2015. ^ Kroll, Justin (August 19, 2015). "Jacob Tremblay, Jaeden Lieberher to Co-Star in Colin Trevorrow's Book of Henry". Variety.com. Retrieved April 8, 2016. ^ Evry, Max (October 5, 2015). "Jurassic World Director Colin Trevorrow's The Book of Henry Begins Filming". comingsoon.net. ^ "Book of Henry Filming – Update | Village of South Nyack". southnyack.ny.gov. Retrieved November 13, 2015. ^ Ferraro, Tom (November 12, 2015). "Our Town: The day the circus came to Williston Park". The Island Now. Retrieved March 31, 2017. ^ Lowe, Kinsey (November 21, 2015). "Colin Trevorrow Tweets The Book Of Henry has Wrapped Filming". Deadline Hollywood. Retrieved March 31, 2017. ^ "Michael Giacchino to Score Colin Trevorrow's The Book of Henry". FilmMusicReporter.com. February 16, 2016. Retrieved March 31, 2017. ^ Vulpo, Mike (June 13, 2017). "Stevie Nicks Releases New Song for The Book of Henry: Listen to 'Your Hand I Will Never Let It Go' Now". Eonline.com. Retrieved June 26, 2017. ^ D'Alessandro, Anthony (May 31, 2016). "Colin Trevorrow's The Book Of Henry to Hit Theaters in September". Deadline Hollywood. Retrieved June 1, 2016. ^ Gettell, Oliver (August 2, 2016). "Colin Trevorrow's drama Book of Henry delayed until 2017". Entertainment Weekly. Retrieved March 31, 2017. ^ Lang, Brent (August 2, 2016). "Colin Trevorrow's 'Book of Henry' Pushed Back to 2017 (EXCLUSIVE)". Variety. Retrieved March 31, 2017. ^ Galuppo, Mia (May 2, 2017). "L.A. Film Fest: Colin Trevorrow's The Book of Henry Set for Opening Night". The Hollywood Reporter. Retrieved May 2, 2017. ^ a b Brooks, Brian (June 18, 2017). "'Maudie', 'The Journey' & 'Hare Krishna' Open Solid – Specialty Box Office". Deadline Hollywood. Retrieved June 19, 2017. ^ Anderson, Ariston (June 26, 2017). "Ischia Fest to Honor Colin Trevorrow, 'Beguiled' to Open Fest". The Hollywood Reporter. Retrieved June 26, 2017. ^ "The Book of Henry (2017)". Rotten Tomatoes. Retrieved April 24, 2019. ^ "The Book of Henry reviews". Metacritic. Retrieved June 23, 2017. ^ McVitty, Caroline (June 21, 2017). "The Book of Henry: Most critics hate, but audiences will love captivating, enlightening movie". The Island Packet. Retrieved June 27, 2017. ^ Holmes, Adam (June 23, 2017). "What Colin Trevorrow Really Thinks About The Book of Henry's Terrible Reviews". Cinemablend.com. Retrieved June 27, 2017. ^ Gleiberman, Owen (June 14, 2017). "Film Review: 'The Book of Henry'". Variety. Retrieved June 14, 2017. ^ Bradshaw, Peter (June 15, 2017). "The Book of Henry review – icky revenge weepie pours syrup over everything". The Guardian. Retrieved June 16, 2017. ^ Yoshida, Emily (June 15, 2017). "The Book of Henry Must Be Seen to Be Believed (But Please Don't See It)". Vulture. Retrieved June 16, 2017. ^ Vishnevetsky, Ignatiy (June 15, 2017). "A tween genius plots a murder in the contrived Book Of Henry". A.V. Club. Retrieved June 16, 2017. ^ Travers, Peter (June 15, 2017). "'The Book of Henry' Review: Boy Meets Girl, Ends Up in WTF Tearjerker-Thriller". Rolling Stone. Retrieved June 15, 2017. ^ Covert, Colin (June 15, 2017). "The Book of Henry: Naomi Watts leads a coming-of-age tale that turns dark". Chicago Tribune. Retrieved June 26, 2017. ^ Schaefer, Stephen (June 16, 2017). "Book of Henry: Endearing, smart tale of child genius". Boston Herald. Retrieved June 26, 2017. This page was last edited on 24 April 2019, at 10:56 (UTC).